The branch is assigned a Virtual Number. 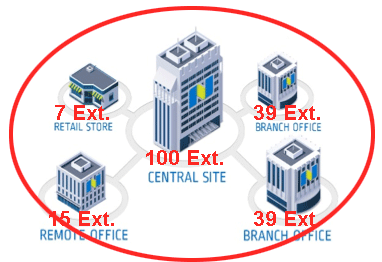 The Virtual Number points to the receptionist extension that is assigned as the Receptionist of the branch office. 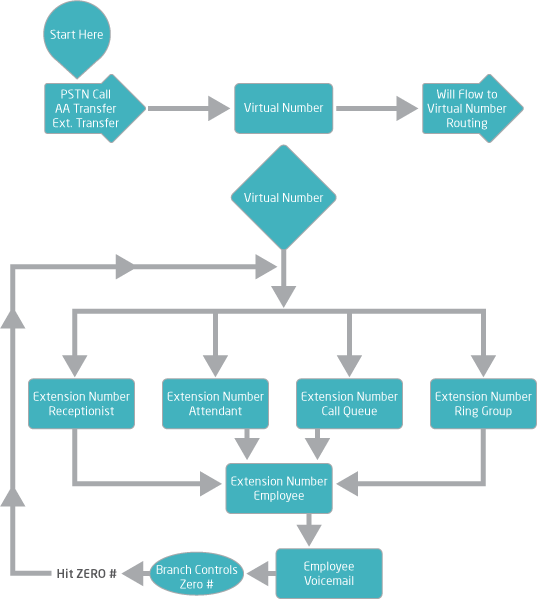 Overflow calls to branch office receptionist can go to voicemail, Auto Attendant, or any forwarding phone number. The receptionist extension is where you set call overflow rules, if required. The caller can leave a voicemail or dial <0#> to be directed to the Branch Receptionist in order to ensure the caller gets a desired response. Switchboard Pro is an application specially designed for handling inbound calls, voicemail, chat and notes. Switchboard Pro enables your receptionist to view real-time presence, manage multiple calls (call park, hold, transfer), coordinate with other receptionists, and toggle Auto Attendant. Switchboard Pro is currently designed to work alongside Polycom desk phones. Public Call Parking, which parks the call on an extension that is available for anyone on the PBX to pick up the call. Branch Call Parking, which parks the call on an extension only available for pickup by an extension defined as part of the affected branch office. Extension or Private Call Parking, which parks the call on a specific extension, only allowing retrieval from that particular extension. For example, the receptionist parks the call on extension 1101, which belongs to Jane Davis. As a result, the parked call can only be picked up from Jane's extension. Let's consider a business with five branch offices. Specialty Cookies has set up 5 stores in California, with a small group of employees at each store. Their main store in San Francisco is a larger operation. Specialty Cookies wants to segment its Company Directory for each branch to streamline branch-specific calls. Let’s look at the requirements for Specialty Cookies, and review how the 8x8 solution can meet the requirements.